the judges of the competition will look at the blog and they will see how many people have commented on the blog. this will improve our chances of winning. if you have any other ideas then just say in your comment. This entry was posted in Guardian Zurich competition by gabriella4. Bookmark the permalink. I think that the ukulele would be good for the school. It helps the children get used to playing instruments. I think the ipads will not help the children to play instruments but the ukuleles will . It will also help the children to play the guitar a little. I really like the idea left by Thomas to buy a range of instruments which would give the kids an opportunity to experience a wide range of instruments they would otherwise never be able to play. Music is a great way to bring people together, it would obviously require teachers or parent volunteers who know how to play the instruments and are able to instruct the children. Ipads are a great idea and very versatile but do they really have the same buzz as learning to play a “real” instrument? Thank you so much for being our first parent commenter! I agree a hands on experience of a real instrument is the ideal. 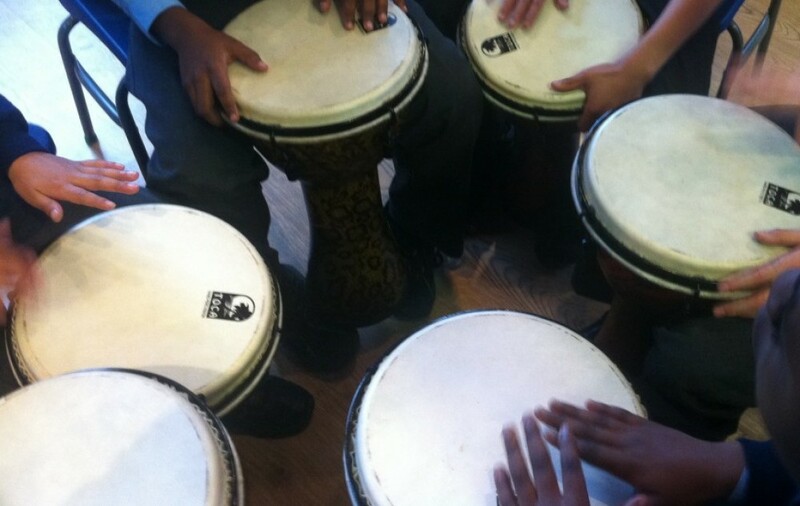 At St Teresa we have been able to teach every child in year 4 the recorder and all the years 5 & 6 children had djembe lessons last year. All of year 5 are going to have the opportunity to sing at The Royal Albert Hall. It would be too difficult and cost a lot more than £5000 to give every child a hands on experience of learning instruments of the orchestra such as the cello but an ipad could give every child a flavour of the sound and style of many orchestral instruments! We can still have great lessons without them but if we did magically win some money I would seriously think about buying them! I wonder if parents might like to see a demonstration of how ipads can be used to teach music? Great stuff gabriella well done for the great posting you have done . The I pads will promot our school learing for our Good. I also think 10 ipads because then people can learn quicker. Why do you think people could learn quicker with I pads?Please explain! I think I like Idea number 2, the 10 Ipads, because we could make an Ipad orchestra and maybe we could put it on youtube. Can I be author please, mrs. If we were too win 5000 pounds I would like too spend it on the ipads because if you have free time in music lessons you will be able too not just one ipad but lots of ipads. because parents and children can learn how to play the drums and it will not take up all the money so we could maybe spend the rest on things for school and equetment in class. I think the iPad idea one is good because you can download diffrent kinds apps about music,and in garage band you can play diffrent kinds of instruments and it’s a lot more easier to those who can’t play real instruments;although I got my own idea which I think it’s quite good,my idea is to halve the money which it would be two £2,500, the other half is for the school to buy new instruments and the other half will go to the poor peoples. What a thoughtful comment Christian. I think it is really wonderful that you have thought about helping people less fortunate than us. I would not be allowed to give away the money to poor people but we could think about using the money to pay for music lessons for the poorest people in our community? What do you think? I think we should have ipads.The reason why is because it would be easier for children who find it hard to play real instruments. It would also make children more keen on music.People would enjoy playing garageband on the ipads too. I think we should buy the 10 I-Pads because if the little children use them it could help them to learn about music. If it was wet play we could record ourselves and post it on Youtube.We can also play games on the I-Pads for fun. I would choose the 10 iPads because of their large memory and list of apps,although, I have my own idea:a list of Instruments such as a Bass,drums,flute or guitar.We would make a nice orchestra with these instruments. I think that the ipad idea is really good and I would choose that but I have my own idea; I think that we could use it to buy other instroments e.g. guitars, keyboards flutes, trumpets and saxaphone. Other than that, I really like the ipads so that will be my decision apart from my own idea so thats the first, my own idea. I choose the IPAD because we get to make our own music and it will inspire kids to learn music and it will really lift people up and will just be exciting getting the IPAD. I would choose 10 Ipads. I choose this because we could make films. We could make a film about the lessons we do or make films about instruments. We could take pictures of Mrs Scheider teaching children or pictures of instruments. We could make songs and prove to the judges that we love music and in lessons we could used Ipads to make songs. i would pick the 10 ipads because it’s like all the other ideas roled into one, so you can resarch all the other ideas and it will apear on the ipad . Why? Because it influences the younger generation of kids to and helps us to be better at the internet.